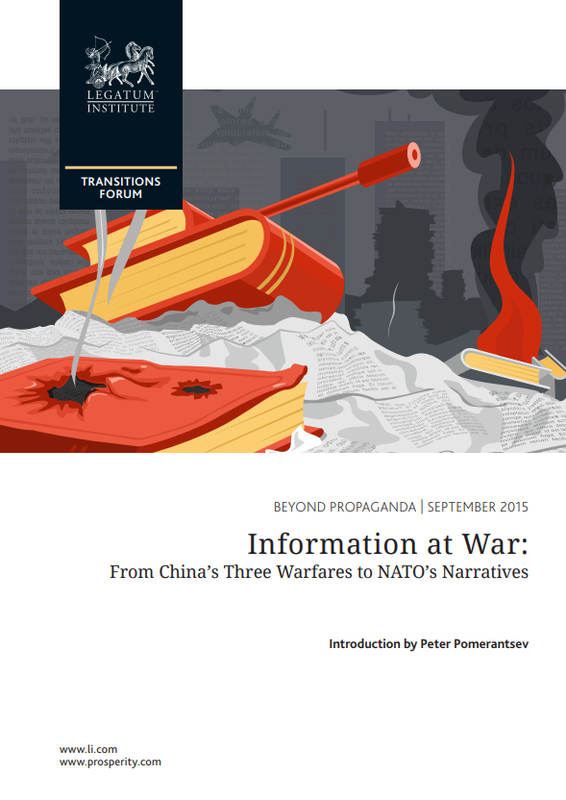 This week, the Legatum Institute’s ‘Beyond Propaganda’ series launched a collection of essays that look at how 21st century warfare is changing and what can be done to react to information warfare. This publication was launched at the Legatum Institute on Tuesday, 22 September 2015. Details here. In the twenty-first century, observes Joseph Nye, Harvard professor and coiner of the term “soft power”, conflicts will be less about whose army wins than whose story wins. Ambitious powers such as China and Russia—powers keen to challenge the global status quo without directly confronting NATO and the US in a military head-to-head—are taking this idea seriously, asking questions about the nature of war and whether winning without fighting is possible. “Supreme excellence consists in breaking the enemy’s resistance without fighting,” argued Sun Tzu back in the fourth century BC. Have the technological advancements of the information age made that ideal possible? Take China’s “Three Warfares” doctrine, adopted in 2003 and described by Laura Jackson as “reinventing our understanding of war” by aiming to “undermine international institutions, change borders, and subvert global media, all without firing a shot”. The Three Warfares concept combines legal, psychological, and media warfare to help achieve a multitude of Chinese ambitions, most notably the expansion of its claims over the geostrategically crucial South China Sea, home to $5 trillion worth of shipping and massive energy reserves. China’s claims here, which include a range of disputed islands, overlap and compete with those of its smaller neighbours, particularly the Philippines and Vietnam—and contradict the boundaries enforced by the UN Convention on the Law of the Sea (UNCLOS) since 1994. More recently, China has been dredging the seabed and using the sand to transform submerged rocks and reefs into artificial islands; here, argues Jackson, it has used “lawfare” to claim that, as these ‘islands’ are “lawful and justified”, Beijing has the right to claim 12 nautical miles of territorial waters around them and a further 200 nautical miles of Exclusive Economic Zones. This is then backed up with psychological warfare, which seeks to demoralise and break the will of China’s rivals through measures such as the threat of sanctions, import restrictions, and harassing the fishing and coastguard vessels of China’s neighbours in disputed waters. Media warfare is pursued through China’s multilingual broadcasters, repeating key themes about how China’s neighbours are “to blame for the multitude of incidents and incursions that occur on China’s periphery”. As Jackson admits, many such tactics, taken individually, are nothing new, and China has been at least partly inspired by the US’s use of sanctions and media in the lead up to both Iraq wars. The uniqueness of the Chinese approach, however, is to combine various elements holistically, all under direct Communist Party control. A recurring theme of the Three Warfares doctrine is the claim that the US is limiting China’s sphere of influence—including blaming the recent Chinese stock market crashes on America. In the words of Lin Zuoming, a Central Committee member and one of the most powerful figures in state-owned industries, the crash was “without any doubt … an economic war” waged by the US on China, following other US attacks on Asia such as the 1997 financial crisis. Diplomats, developed mathematical formulas describing the effect of “psycho viruses” and argued for the need to develop a “strategy of psychological defense to prevent or neutralize attempts to control the psyche of Russian society”. For many years such authors were largely marginal, but today similar concepts are mainstream. Current Russian doctrine describes the country as under information-psychological attack from a West that is looking to infect the population with the virus of colour revolutions—attempting, in the words of an article in the Journal of the Academy of Military Sciences, to “change citizens’ traditional moral values and manipulate the consciousness of social groups by implementing so-called democratic transformation”. Much like in China, senior Russian military figures have been thinking about the role of non-physical conflicts. Shortly after the 2008 war with Georgia, Colonel-General Anatoliy Nogovitsyn, a deputy chief of the General Staff, argued that in the wars of the future the primary mission for Russian military forces would be disorganisation of “the functioning … of military-political leadership, troops and population with the use of modern information technologies and means”. Nogovitsyn stated that “information weapons provide states with a method of gaining advantages without a declaration of war”. The Crimean operation raises other new questions. “The Kremlin’s disinformation campaign during the seizure of Crimea is unique,” writes Nimmo, “in that it was deliberately exposed as a lie by the Kremlin itself.” Prior to the annexation, as unmarked “little green men” took over the peninsula, Putin publicly denied the presence of Russian troops and claimed the soldiers were “local self-defence units”. Back in the Cold War, US “black ops”, such as Edward Bernays’ recasting of a democratically elected government in Guatemala as communist to enable a US-backed coup, or the USSR’s “active measures” claiming that the CIA had invented AIDS, were meant to be persuasive in the long term—and those looking to establish the truth would score major victories if they could prove their opponent was lying. Today, argues Nimmo, this is no longer the case: “You can’t out-debate an opponent who doesn’t even take his own argument seriously … a responsive campaign is a losing campaign.” There are at least two elements to information war: “weaponised information”, the use of information to divide and conquer, distract and dismay, and “a war on information”. To combat the latter, Nimmo introduces the concept of “information defence”, a pre-emptive approach that allows a lie to be stopped before it has time to spread too far. This would involve governments sponsoring exchanges between journalists, academics, and experts in sensitive areas: between journalists in London and Russian-populated parts of the Baltics, for example, or between analysts in the Middle East and parts of Western Europe where ISIL messages are penetrating. When disinformation started to spread, an international network would be in place to debunk it instantly, with credible voices who already spoke the language of local audiences. “Governments and elected officials are not viewed as reliable sources of information,” writes Nimmo, “so it is important that trusted NGOs and commentators can communicate the truth.” But without state help journalists and NGOs struggle to support in-depth, international research. Nimmo’s concept would ensure that bodies such as the EU would provide “hands-off funding” for exchanges but without having any editorial say. Kremlin disinformation is not random, argues Laity. Rather, it fits into a larger mosaic which goes from rejecting Kiev’s right to self-rule up through a global vision where Moscow throws off US unipolar rule to dominate its region and unite with other large powers, such as China, who want to dominate theirs. We can only hope that this is still possible ideologically, but the issue of how to organise such strategic communication remains. In the Cold War governments were, for good or ill, behind efforts as diverse as publishing the magazine Encounter, helping publish the translation of Doctor Zhivago, funding the BBC World Service, and setting up the myth-busting Active Measures Working Group. Many such activities would be deemed unacceptable today. How does one coordinate the work of the private, public, and non-commercial sectors so that the phrase “our strength is in diversity” actually means something? The 21st century is seeing a new scale of media manipulation, psychological war and disinformation. The technological capacity of the information age, a more liquid use of ideology by authoritarian regimes, and the West’s own difficulties in projecting democratic values have redefined the threat of propaganda. The Transitions Forum’s ‘Beyond Propaganda’ series investigates these challenges and aims to identify solutions. The Transitions Forum is a series of projects dedicated to the challenges and possibilities of radical political and economic change.